Swaying palms, white sands and sparkling waters are the three essential elements that attract 2 million visitors annually to Goa - also known as 'the pearl of the east', is known for its Gothic churches, age-old ruins, palm-fringed beaches, coconut groves, ferry rides, and bubbly folk music. Goa is a perfect tourism heaven for the ones who need and want relaxation. Goa is one of India's special tourism places, a State seemingly blessed with fabulous weather, even more fabulous beaches, delightful people, good food, hill-top forts, little white-washed churches, soaring Portuguese-era cathedrals, a unique cultural legacy-small wonder. Trails of palms and coconut trees cast a spell to the local inhabitants, which make their hearts fill with joy and happiness. Those who haven’t visited Goa tend to imagine it as some kind of Indian Costa Brava but, with more cosmic karma and, thanks to this image, many people vow never to set foot there. However, Goa, like everywhere in India, is never quite what you expect. In places the infamous hash-fuelled days of Goa’s golden hippy years are still alive and kicking and in others the all-inclusive package holiday is king. But these are two very narrow sides of the Goan experience and anyone who spends much time here will discover that Goa contains more variety and vitality than almost anywhere else in India. 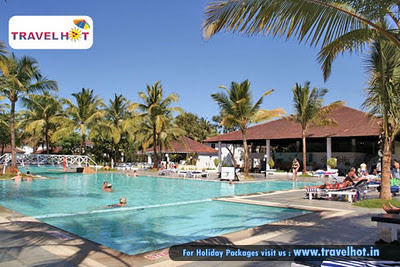 Ideally in around 3 – 4 days one can easily roam around entire Goa at ease. This is because it’s a small state and is divided into two districts: North Goa and South Goa. Panaji is the headquarters of the North Goa district and Margao of the South Goa district. It's also called the Lovers' Paradise; a picturesque spot with a fine view of the Zuari River and Mormugao Harbour. The Dona Paula beach is named after Dona Paula de Menezes, daughter of a viceroy (in colonial India), who threw herself off the cliff, when refused permission to marry a local fisherman, Gaspar Dias. Water sport facilities are available at this beach. The Dona Paula Sports Club offers water-scooter, cycle, and motorboat rides. Other water sports include windsurfing, parasailing, water-skiing, toboggan ski-biscuit, skibob, sports fishing, snorkeling, harpoon fishing, kayaking, and yachting. Miramar beach is situated near the capital city of Panaji at the mouth of the River Mandovi. It is a frequent destination for the city folk to come and unwind in the evenings and on weekends. Though not very clean, it does offer a welcome escape to the people of the city. The Miramar beach is a beautiful expanse of fine golden sands that is dotted with tall coconut trees. The vast blue sea in front of the beach is just mesmerizing and during sunset, looks absolutely marvelous. The beach is lined with thick covering of palm trees that provide an exotic look to the beach. Tourists can always take a long walk under the shady trees and relax on the beach. The Miramar beach looks magical on a moonlit night when the silver moonlight makes the sand glow in a whitish silver shade. The best time to visit the Miramar Beach is from November to March. One can find over 500 species of birds like gulls, plovers, etc. coming to the Miramar beach every winter in order to escape the harsh winters of the north. The beach provides the ideal site for them to stop and nourish themselves. Food is available in plenty in the form of small fish, crabs and other small aquatic creatures. The Calangute beach of Goa is known to be the busiest and the most commercialized beach. This beach is a favorite among tourists who come to India to visit this paradise called Goa. The beach is lined with local shops and stalls that sell everything like trinkets, souvenirs, beach wear, exotic beach stuff, handicrafts, etc. Don't be afraid to bargain with the shopkeepers. The quality of the items is usually good and if you can bargain well, you can buy most of the things that catch your eye. Water sports such as parasailing, water skiing and wind surfing at the beach starts in the afternoon when the wind is blowing just in the right direction and it goes on till sunset. Sinquerim Beach is located about 13 kms from Panaji. Taj Hotel group has set up the Heritage Complex here which dominates the place around the historic Fort Aguada. There is an uninterrupted stretch of firm sand from here all the way north to Baga Beach and if you love to have a long beach walk, there cannot be a better place. Baga beach of Goa is considered to be an extension of the Calangute beach. Though the starting point of the Baga beach and the ending point of Calangute beach is not known, the Baga beach can be reached easily from the Calangute beach. There is the grove of palms that comes fairly close to the water's edge. The Baga River flows down one side of it offering a pleasant diversion for children and those who love the water. Where the river and the sea meet, and on the far right bank, there is a group of black rocks against which the sea crashes in dramatic explosions of spray. Candolim Beach is a beautiful section in the continuing stretch from Calangute in North Goa district of Goa, India. This place has been largely dominated by tourist shops, restaurants and hotels. Apart from sunbathing, shopping for trinkets and eating, there is not much one can do in Candolim and that makes for a relaxing holiday. Candolim Beach is another relatively busy soft sandy beach. Hawkers selling mostly cheap clothes and along with masseurs offering massages makes the beach a lively spot. One of those few beaches with a naturally mystical look, the Vagator beach does not have to try too hard to attract visitors. The beach looks absolutely ravishing with red laterite cliffs and black lava rocks here and there on the fine white sand. The swaying coconut trees and turquoise blue sea with a ship on the horizon looks like painting moving in front of your eyes. The two prominent beaches here are the North Vagator Beach (Big Vagator) and the Little Vagator beach (Ozram beach). These beaches are separated by a stretch of land which acts a flea market selling souvenirs, hats, T-shirts and collectibles. This beach is famous with the party crowd and hosts trance and dance parties during New Years' eve. There are a number of pubs and restaurants serving Goan / Mediterranean cuisine. Anjuna Beach is one of Goa's most popular beaches. It is located north of Baga and Calangute beaches, and close to the South of Vagator and Chapora. The Anjuna beach is famous for its trance parties that take place almost everyday. The exotic Anjuna beach of Goa is the ideal beach to go swimming in the placid blue sea. Anjuna is just the right place for lazing holiday goers. Besides the calm waters of the Arabian Sea lapping softly on the Indian shore, Anjuna comes live with its ever-famous full-moon parties and the Wednesday flea market to take one on to a trance trip. The main attractions of Anjuna Beach are the magnificent Albuquerque Mansion built in 1920 (flanked by octagonal towers and an attractive Mangalore tile-roof), the Mascarenhas Mansion, and the Chapora Fort. Mandrem Beach is a beautiful but deserted beach. Just a few shacks offer ordinary food, but the beach and sea are worth it. Mandrem beach is near the Arambol beach in Pernem Taluk in North Goa. The beach is surrounded by hordes of Coconut palms and Casuarina trees. Arambol beach of Goa is one of those beaches that is less frequented by visitors as compared to other popular beaches. Its secluded location in the north of Goa makes it untouched and unspoilt. Though it is not thronged by crowds, the Arambol beach is visited often by tourists who look for tranquility and peace and a dreamy place such as the beach to relax. The Arambol beach of India also has sulphur springs that have medicinal properties and freshwater lakes where one can swim. Bogmalo is last southern beach before you get to Panaji is the first southern beach to be discovered by visitors. Bogmalo beach of Goa is small fishing village located at a distance of 4 kilometers from the Dabolim airport of Goa. Bogmalo beach is dotted with tall palm trees which makes the Colva bay even more beautiful. Bogmalo beach is not as a crowded as other beaches. The green hills on its three sides, golden sand and gentle surf make Bogmalo nothing short of paradise. Out at sea is the Grande Island around which many diving sites are located. The water is safe and shallow till quite some distance which makes it ideal for going on a diving expedition. The concerned authorities at the beach provide all necessary facilities for diving at the Bogmalo beach. The Palolem beach is the most beautiful and popular beach in South Goa. This beach is the most photogenic beach in Goa since it has a crescent shaped coastline and fine white sand. It is also surrounded by hills on both sides, resulting in a calm, idyllic sea in which you can walk into up to 100 meters. One can try to persuade one of the fishermen to ferry you across to spot dolphins. Agonda Beach is not a famous or much explored beach as compared to others. However, one should certainly visit this beach if looking out for peace, silence and privacy. There is a hill to the south of the beach. One should ideally come here in a proper picnic mood as in school by carrying their own eateries as there are very few facilities available here. It is not advisable to swim here as there are no lifeguards and the current is strong as well. Colva Beach is the most loved beach of Goans. Many tourists can be seen having a sunbath on the golden sands of Colva. The entire stretch of the Colva beach to nearly 20 kms is beautiful and marvelous to look at. The beach is a delight for shell collectors and one will find beautiful patterned shells out here. As the current is not that strong here, beach is considered quite safe to swim. Benaulim Beach is also similar to Colva beach. However, it is more serene and peaceful. Though this beach is just 2kms away from Colva, this team is relatively undiscovered by domestic tourists. This beach is generally crowded during weekends and evenings to eat fresh sea food which is cooked in the exotic Goan style. Panoramic group of companies has travelhot.in. Our travel experts will help you with deciding where and what your next vacation will be; help you with any airline reservations, offer you information on the options in travel insurance, and ensure you have all of your travel documents in order before you depart. In fact, you will work with a personal travel expert throughout the whole process. You can contact your travel expert via email or telephone for your travel needs.